March 11 marks the third anniversary of the 9.0-magnitude earthquake that shook northeastern Japan in 2011, triggering a tsunami in a dual disaster that killed more than 16,000 people. The earthquake and tsunami caused the worst nuclear disaster in history with three meltdowns at the Fukushima Daiichi Nuclear Power Plant. Three years after the catastrophe, 136,000 people from Fukushima prefecture are still displaced, and numerous disaster-related deaths have resulted from stress-related illnesses and suicide. Because of the nuclear meltdown, highly radioactive material continues to leak into the ocean, presenting numerous technical challenges with no solution yet in sight. This environmental contamination, which has impacted residents, workers and military personnel responders, will have a global effect. Lessons learned from Chernobyl suggest that all this is only the tip of the iceberg. “The Great East Japan Earthquake” is just one of several massive disasters in the Asia-Pacific this past decade. The 2004 Indian Ocean Tsunami took the lives of 230,000 people in fourteen countries. Most recently, Typhoon Haiyan (Yolanda) ripped through Samar and Leyte in the Philippines, causing 6,000 deaths last November. The Philippines has witnessed several other devastating typhoons, including Ketsana (Ondoy) in 2009 and Bopha (Pablo) in 2012. 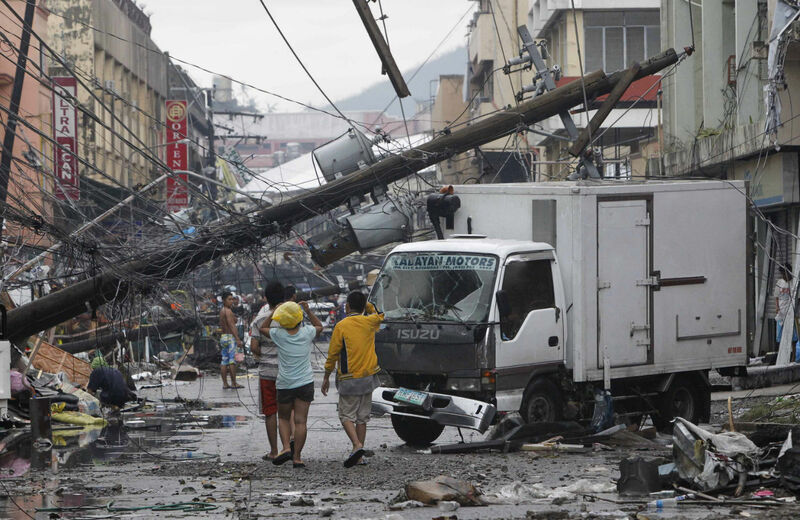 A rising pattern of intense storms and disasters in the Asia-Pacific region has led to the death and displacement of thousands of people and the destruction of essential urban and rural infrastructure such as roads, bridges, schools, health centers and workplaces. Paralleling these disasters has been the disaster response of the US military. According to this “disaster militarism”—which is a pattern of rhetoric, beliefs and practices—the military should be the primary responder to large-scale disasters. Disaster militarism is not only reflected in the deployment of troops but also in media discourse that naturalizes and calls for military action in times of environmental catastrophes. Military Humanitarian Assistance and Disaster Relief (HADR) operations, such as Operation Damayan in the Philippines in 2013 and Operation Tomodachi (Friend) in Japan in 2011, have showcased the US military’s “helpfulness,” legitimized its presence and softened its image. Charles-Antoine Hofmann and Laura Hudson, researching this topic for the British Red Cross, note several factors driving the growing military interest in responding to disasters. Assisting relief efforts, they observed, can improve the military’s image and provide training opportunities. It is also a way for the military to diversify its role when armed forces face budget cuts. Disaster relief has also become part of the justification for increased US troop deployments in the Asia-Pacific region—even as the new military basing component of the “Pacific Pivot” has met with strong opposition in Okinawa, Japan and Jeju, South Korea. This massive permanent presence in the Asia-Pacific region has enabled the US military to be the “first and fastest” to respond to sudden calamity. The Pacific Command boasts 330,000 personnel (one-fifth of all US forces), 180 ships and 2,000 aircraft in an area that spans half the earth’s surface and is home to half the earth’s population. Disaster relief is not the military’s primary mission, role or area of expertise. Nevertheless, disaster response missions facilitate military expansion and dominance. Yoshiyuki Uehara, the vice-governor of Okinawa at the time of the earthquake and tsunami, has opposed the plan to construct a new offshore US Marine base on the island. “I hope we stop glorifying Operation Tomodachi,” he said. “Our gratitude [for US military assistance after the earthquake and tsunami] and US military base problems are separate issues.” The core of Operation Tomodachi was Joint Task Force 519 from the United States Pacific Command. Arguably, the response to disaster was a perfect opportunity for the United States to demonstrate to China that an immediate US-Japan joint military operation was possible. This was not the first time that disaster relief was used to further larger geopolitical and military goals. The rapid mobilization of assistance using military capabilities from the United States, Japan, India and Australia in the wake of the 2004 Indian Ocean Tsunami “set the ball rolling for a four-way security dialogue a few years later,” former Australian diplomat Rory Metcalf has argued. Just weeks after Typhoon Haiyan, meanwhile, the Philippine and US governments were touting relief efforts as justification for moves toward a new long-term agreement for greater bilateral military cooperation and an increased US military presence in the Philippines (the Philippine Constitution currently bans permanent troops and bases). Washington has used disaster militarism as additional leverage to pressure the Philippine government to accept a mutual defense agreement. The race to provide relief for political leverage is not limited to the United States. China offered its 14,000-ton floating military hospital, the Peace Ark, for Haiyan relief efforts—its first humanitarian response operation. Japan also sent military forces to the Philippines for relief work, in cooperation with the US military, a political effort by the current Japanese government to secure a greater military role overseas. The conflation of military power and disaster relief is highly problematic. It is not cost-effective, efficient or transparent. Military operations exhaust limited budgets for humanitarian assistance, rehabilitation and reconstruction activities. Confusion about the military’s role as soldiers or relief providers can lead to suspicion and fear, and some people may not access relief as a result. According to the Department of Defense, the Pacific Command offers not only aid to countries in the region dealing with disasters, but also “forms of advice and assistance, training, satellite imagery or intelligence, surveillance, and reconnaissance support.” More troops on the ground offer greater opportunities for the gathering of intelligence. Revelations that a CIA-funded fake vaccination program in Pakistan was used to find and kill Osama bin Laden provide another example of co-mingling humanitarian relief and military operations, rightly contributing to civilian confusion, public distrust and questions of transparency and accountability. Disaster militarism does not address the underlying causes for the increasing number of intense storms and natural disasters. Nor can disaster militarism be separated from the US military’s record as a the “worst polluter on the planet” for its “uninhibited use of fossil fuels, massive creation of greenhouse gases, and extensive release of radioactive and chemical contaminants into the air, water, and soil,” as a recent Project Censored story detailed. In times of disaster, the US military positions itself as a “savior” and attempts to obscure its role as a major contributor to the rise of climate disasters. There is certainly an urgent need for disaster preparedness, with trained emergency personnel in local communities as well as international teams. The first responders in disasters are families, neighbors, community groups, professional organizations, churches, international humanitarian organizations and governments. Resources should go to these local institutions to strengthen their capacity to respond to disasters and continue the work when emergency teams have all gone home. Padayon sa Pag-laum (Hope After Haiyan or WEDPRO) and other local Philippine organizations focus their relief efforts on the needs of the most vulnerable sectors of society, especially women and children. Their longer-term goal is to co-create solutions for a more resilient, more sustainable and more inclusive future for the communities affected by the typhoon. Nor should we wait for climate disasters to hit before we respond. Long-term and sustained resources should be made available ahead of time, especially to countries like the Philippines that experience typhoons on a regular basis. This would make for greater local independence in allocating relief resources. It would also lessen dependency on military operations. World military expenditure totaled a massive $1.75 trillion in 2012, with the United States and its allies responsible for the vast majority. These expenditures, which have made disaster militarism such a prominent feature of humanitarian relief operations, have not created more security for individuals, nations or the planet. The alternative approach, human security, requires a physical environment that can support life; guarantees people’s material needs for livelihood, food and shelter; and protects people and the environment from avoidable harm. To minimize the impact of climate disasters—and reduce the contributing factors to the uptick in hurricanes, typhoons and big storms—the disaster militarism model must give way to the human security model as soon as possible. Annie Isabel FukushimaAnnie Isabel Fukushima is a member of Women for Genuine Security and contributor to Foreign Policy In Focus. Ayano GinozaAyano Ginoza is a member of Women for Genuine Security and contributor to Foreign Policy In Focus. Michiko HaseMichiko Hase is a member of Women for Genuine Security and contributor to Foreign Policy In Focus. Gwyn KirkGwyn Kirk is a member of Women for Genuine Security and contributor to Foreign Policy In Focus. Deborah LeeDeborah Lee is a member of Women for Genuine Security and contributor to Foreign Policy In Focus. Taeva SheflerTaeva Shefler is a member of Women for Genuine Security and contributor to Foreign Policy In Focus.